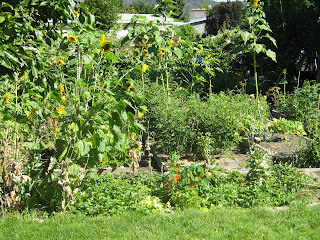 Here are some pictures of the garden this morning, things are growing like crazy. I planted a squash in one of my compost bins and now it has decided that it should be able to take over the entire back corner of the garden. The pumpkin plants are trying to overrun the tomato plants and the grapes just want to rule the world. I often feel as if you can almost see that things (especially viney things) have grown overnight. 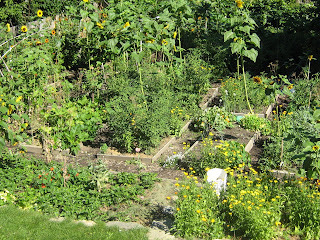 Gardening, to me, really is a special kind of magic, and I have to admit that I sometimes think of non-gardeners as sort of muggles, in a fond way, really, not in a mean way. I do feel that someone who has never grown anything from seed, someone who has never gotten to perform that magic on their own, is missing out on something special though. 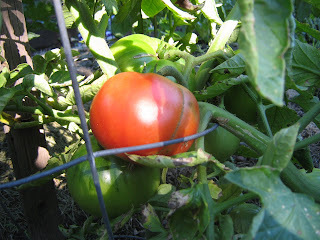 First tomato is nearly ripe. I think I will sit out in the garden tomorrow and eat the whole thing myself. 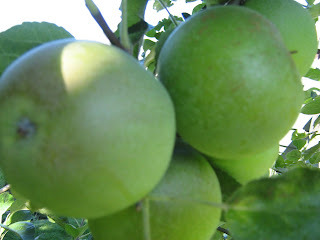 :-) We are growing our apples and pears organically, which is no easy feat where I live. You have to convince the SIR team that you are doing your utmost to combat nasty coddling moths. They have the power to make you strip your trees of all fruit (which I have had to do for the last 3 years) or even to cut down your trees(which is what they prefer). I have really had to keep on top of our trees, it is a lot of work and it makes me feel that whatever price growers are asking for organic apples and pear is a bargain. Yesterday I thought I would have a nice relaxing day. I wanted to pick some of our apricots, do a bit of gardening and then finish reading this book. 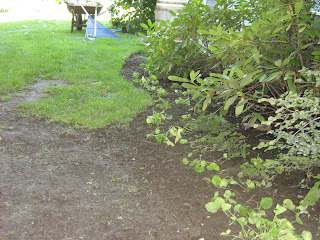 You can see along the sides I have planted tons of violets, they make a great groundcover and grow quickly. 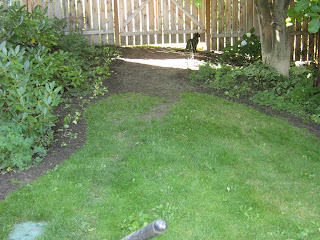 I need to decide if I want to do a flagstone path or just a pine needle path. In another month or so when the violets and moss that I planted start to take off I will rip out more of the grass. To me, there is nothing better than a day spent outside, it doesn't matter if it is at the beach, in the garden or up on the mountains as long as it is outside.